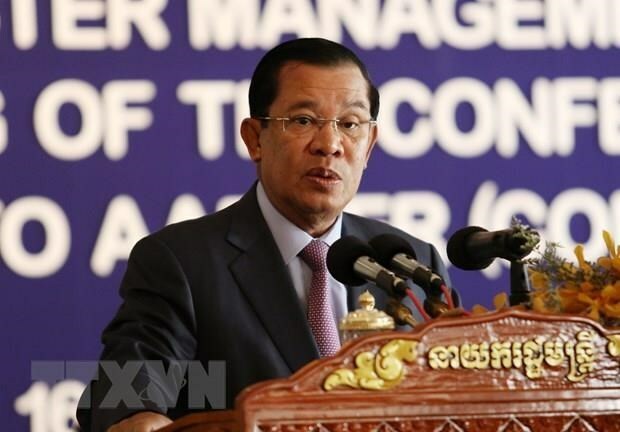 Phnom Penh (VNA) – Cambodia plans to step up cross-border trade activities and has begun talks with neighbouring countries to intensify trade ties, Cambodian Prime Minister Hun Sen said on April 2. Speaking at a ceremony to inaugurate a Japanese-funded 26-million-USD water supply system in Kampot, Hun Sen said that the country began talks for increased bilateral trade with Laos, Thailand and Vietnam to open new border gates. Cambodia had previously announced a series of urgent measures to strengthen the independence of the economy and support domestic exporters given the context that the European Union is considering the removal of preferential trade arrangements under the Everything But Arms (EBA) scheme, which unilaterally grants duty- and quota-free access to the world’s least developed countries. In 2018, trade volume between Cambodia and Thailand amounted to over 8 billion USD; Cambodia-Vietnam, 5 billion USD; and Cambodia-Laos, 24 million USD.